Avalara's new Avatax app offers a free, easy way to look up sales tax rates across the U.S. through a touch map interface with clear, detailed delineation of the 11,000+ sales tax jurisdictions nationwide. From a visual perspective, the Avatax app provides a graphical map interface that shows tax jurisdictions overlaid on a map, giving users an interesting opportunity to see precise sales tax boundaries and corresponding rates, which can vary drastically block by block. Can an app add interest to sales tax calculation? Avalara, the market leader in sales tax automation for businesses of all sizes, says its new Avatax Rates app does that and more. 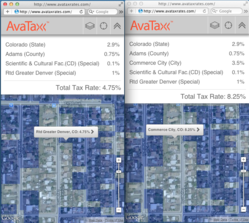 Specifically, the Avatax app offers a free, easy way to look up sales tax rates across the U.S. through a touch map interface with clear, detailed delineation of the 11,000+ sales tax jurisdictions nationwide. Avatax Rates is fueled by Avalara’s industry-leading geo-location engine, which calculates precise sales tax rates based on geographical coordinates. This allows Avalara customers – including mobile users – to accurately conduct business from virtually any place on earth. From a visual perspective, the Avatax app provides a graphical map interface that shows tax jurisdictions overlaid on a map, giving users an interesting opportunity to see precise sales tax boundaries and corresponding rates, which can vary drastically block by block. This unmatched level of accuracy gives businesses many advantages, including greater risk mitigation in the event of an audit, and reduced customer service issues related to incorrect tax rates. Avalara also provides businesses the ability to file and remit sales tax with the highest level of confidence. The free Avatax Rates app is available for Android, iPhone and iPad users and can be found at http://www.avataxrates.com, Google Play, Apple and Amazon app stores. Additionally, AvaTax Rates works as a web app on all major browsers. Established in 2004, Avalara is a founding member and Certified Service Provider of the Streamlined Sales Tax initiative and one of the fastest-growing companies in America. It employs more than 250 professionals at its headquarters on Bainbridge Island, WA and offices in Seattle; Irvine, San Diego and Rocklin, CA; Falls Church, VA and Pune, India.